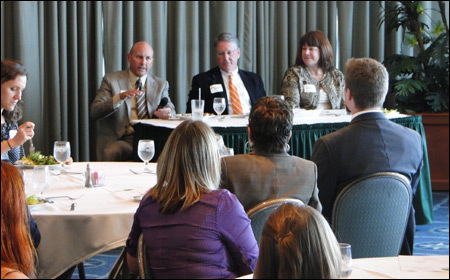 Paul Rice of the Rice & Rose Law Firm, pictured here at left, was one of three presenters at a Volusia County Bar Association Young Lawyers Division luncheon on April 17, 2014. Rice, along with Circuit Court Chief Judge Terence Perkins (middle) and Mary Ellen Osterndorf ( right) spoke to approximately 40 lawyers on the topic of Tips for A Successful Practice. The speakers shared their respective stories about how they started their law practices and provided tips to younger lawyers who were interested in starting their own law firms. Mr. Rice is a past president of the Volusia County Bar Association and currently chairs its Family Law Section. The Bar Association has 550 members and is headquartered in Daytona Beach, Florida.